There are certain models that define an era. From the 1920s the ‘Bullnose’ Sunbeam Model 90 is one. The Sunbeam Model 90 has always been, so far as I’m concerned, one of the vintage motorcycles in a select band of the crème de la crème of pre-1931 offerings. 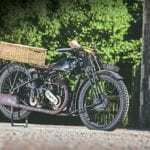 And to many, the 1927-28 Model 90 is the pick of the model too, the so-called ‘Bullnose’ models, a machine with an evident ability borne by Charlie Dodson’s win in the 1928 Senior TT, among other notable successes. That Dodson won the ‘Senior’ again the next year, on a saddle-tank evolution of the 1928 machine, would, one might imagine, make the last of the vintage 90s the most desirable. But not so. The Bullnose (1927-28) is the one that everyone wants. Why Bullnose? It’s to do with the shape of the petrol tank, which has a rounded front end, differentiating it from the also 500cc Model 9, the at-a-glance similar model in the range, and the one on which the Bullnose 90 is derived. It all gets a little confusing, though, with 9s, 90s and then the 350cc versions (8 and 80) in the equation too. To understand the origins of the 90, it is worth having a look back, as the model has a lineage that dates back to, arguably, before the First World War and Sunbeam’s racing history. Sporting side-valves were Sunbeam’s first competition stock in trade, the culmination of which was Alec Bennett’s win in the 1922 Senior TT, the last time a machine with the valves so configured triumphed in what was then the biggest and most important motorcycle race. Despite victory, Sunbeam knew the model needed an update and overhead valves was the way to go. The first available-to-buy ohv Sunbeam was launched at the end of 1923 as the Model 9. 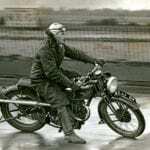 It really was as ‘hot stuff’ as it was possible to buy and while the chassis and running gear all came from the famous Longstroke, the engine was based on the work of Sunbeam’s engineering genius and racer extraordinaire George Dance, with other famous names (designer John Greenwood and Tommy de la Hay) also having involvement. 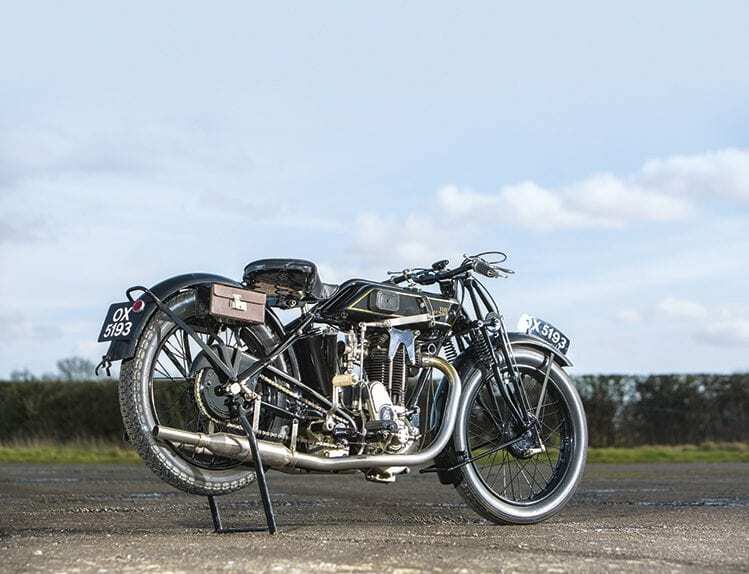 The 9 soon established itself as the model of choice for many speedmen, while Sunbeam continued to race its own examples, though the factory race team went in another direction in 1925 with the overhead camshaft ‘Crocodiles’ – though that’s a different story. Suffice to say, the Crocodile (so named, supposedly, by Graham Walker, as there was a ‘tick, tock’ noise emanating from the bevel drive that reminded Walker of the crocodile that swallowed a clock in Peter Pan!) lacked any feel, performance or snap and, basically, the ohv jobs were faster. 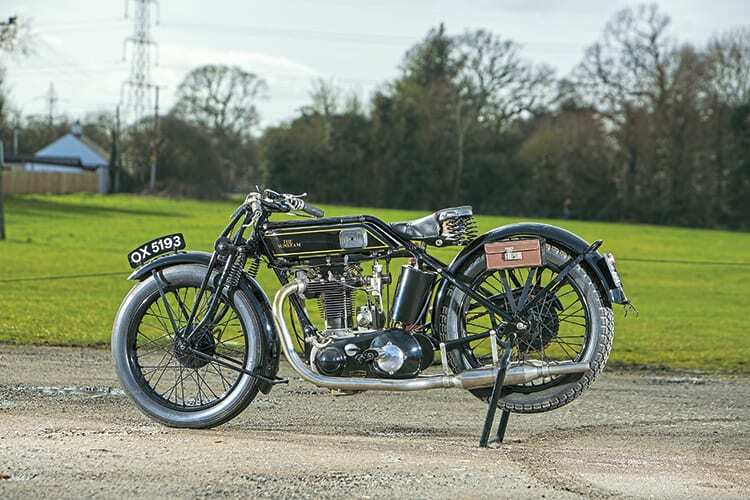 So Sunbeam swapped back to racing the ohv in 1926 and then for 1927 came the first ‘Bullnose’ Model 90 available to the public. At the same time the 9 gained fixtures such as valanced mudguards and became more of a sports tourer (the 1924-26 ‘parallel’ 9 is the 90’s spiritual predecessor; the name ‘Parallel’ was adopted to distinguish it from the Sprint, which had a small, beautiful triangular fuel tank; the Parallel 9 has two frame tubes running thus) though it was still a lively performer. But the 90 was at another level. wired-on tyres, to replace the earlier beaded edge jobs. Like 1927, the Model 90 cost £105; the single-port Model 9 and the 492cc side-vale Light Tourist (which used the long-stroke engine) were £78-15s. 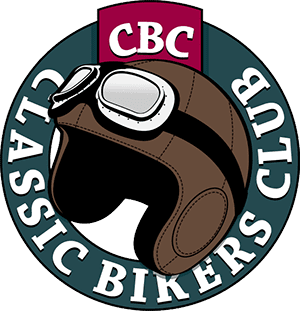 As a comparison, a 680 ohv Brough Superior was £100-16s, a Norton Model 18 £63-10s (a CS1 £89) and the new ohc 498cc AJS K10 was £73 (the 498cc ohv K8 £59-10s). 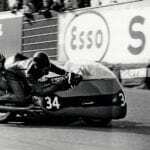 A few other random prices out of interest – a 498cc Scott Flying Squirrel was £93-9s (an extra £3-3s bought a 596cc engine), a 976cc Royal Enfield Model 182 £70, while there were modern looking (saddle-tank) 500cc ohv offerings from the likes of Ariel, Rudge and BSA for around £50-55, half the price of a Model 90. 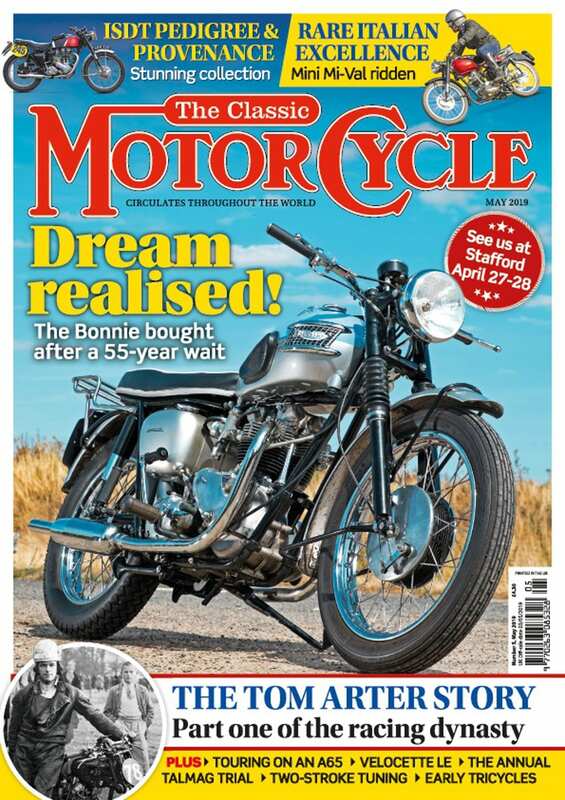 Writing in the Marston Sunbeam OC magazine of summer 2017, the restorer of OX 5193, Peter Woodward, says: “OX 5193 was prepared at the Sunbeam factory as a reserve for the 1928 TT, but its rider was injured in practice on another machine and this one remained unused. “The Sunbeam showroom at 194 Broad Street, Birmingham displayed the bike for sale in June 1928; an unknown gentleman used it to race at Pendine Sands during the summer and he returned the bike to the showroom for re-sale afterwards. 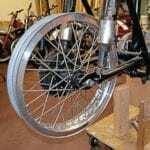 The bike is not a works Model 90, however, the CT close ratio gearbox, without kick-start or components; the kick-start hole in the gearbox was blanked off with a genuine plug, this was slightly domed and plated in nickel. The Binks three-jet carburettor for performance and the WM2 21 inch front wheel are how it left the factory ready for racing at Pendine Sands. 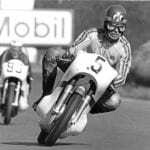 “The second owner, Mr Bate, was employed as works managers at R T Shelley, the engineering company that bailed out Norton Motorcycles when it became bankrupt. “The third owner, Mr Shelton, worked at the Sunbeam Elms factory as a fitter, where they serviced and overhauled customers’ bikes. He rode the Model 90 during the war years, and one night he ran into a bomb crater in the dark, which seriously damaged the frame. “The Model 90 was then stored in an upstairs bedroom for a very long time, until eventually the house was condemned. I was contacted by a friend about the house clearance and drove over to the contractor’s yard to see the bike. He refused my offer of £1000 and said the bike would go to auction at Phillips in London. I prepared for the drive to London, using a Mini, of which three of the seats were removed, ready to buy the bike after dismantling. There was no buyer’s premium to pay at auction and I bought the Model 90 for £800. After restoration, Peter sold the Sunbeam to the National Motorcycle Museum. Only four Sunbeams were entered for the 1928 TT and none of the riders were injured in practice. Jock Porter withdrew, but his bike was taken over by Australian Arthur ‘Digger’ Simcock, which wouldn’t have left a ‘spare’ 90. Perhaps OX 5193 was taken as a reserve/practice mount? There is only one press report of a sand race at Pendine in 1928 – A W Nicklin won a one-mile race on a Sunbeam, so maybe that was OX 5193. A chap named Cyril Bowles was also a prominent competitor on a Sunbeam. So what did I do with the Sunbeam? Well, simply, I rode it. There were a few niggling issues, which is to be expected of a motorcycle that had done little mileage, and during my tenure, it never carburated as smoothly or cleanly as it should. It felt taut and tight and certainly has plenty of ‘beans’ (Beams?) but quickly opening the throttle only provoked a stutter and I didn’t have the grunt to keep up with my friend John’s ‘big’ vintage cammy Velo. The performance would be cured with some carb adjustment and experimentation, I’m sure. Thing is, one really doesn’t want much more performance, as it’s already so quick compared to (almost) anything from its period, plus most motorcycles 30 years newer. Cruising at 55-60mph is absolutely effortless, even with the carb not playing fair, though there’s not that ‘punch’ to happily overtake as the Sunbeam currently is. I used the Sunbeam on four events (Banbury, a pre-31 weekend, the Breckland weekend in Norfolk and another pre-31 run, at the start of October) and I loved every minute of it. The best it went was at Banbury, the hottest day of the lot, perhaps pointing to the carburettor, and the only minor problem I had was on the last run, when the tappets opened up at the lunch stop. I was at the midway stop for one run, miles ahead of everyone else, while I rode in the company of guys on 1950s and Sixties machines on the VMCC Breckland weekend, clocking up about 120 miles in the day. OX 5193 is now fitted with a kick-start and also has the BT gearbox internals, which are the mid-range (as opposed to close ratio CT) Sunbeam offering. It is really quite flexible, and possessed of good, strong torque, though trundling along one could feel it starting to get a little bit hot and bothered, and oily. It just wants to ‘go,’ basically. The recirculating oil is monitored (and turned on and off) by a needle valve; taking advice from Richard Rosenthal, who has a similar model, he’d reckoned on a turn and a half to allow adequate flow, which is what I ran it at most of the time. What is disconcerting is that it’s not possible to see oil returning to the tank when stationary and taking the cap off, so one relies on the ‘tell tale’ on the pump being out to know there’s oil circulating. over-advancing it. Once running, the Beam would settle into a nice, thudding, even beat. There was a hint of the typical Sunbeam ‘graunch’ into first gear, but the clutch – which had benefitted from some expert Woodward attention – was better (smoother, more progressive) than any Beam I’ve experienced. It didn’t need adjusting all year.